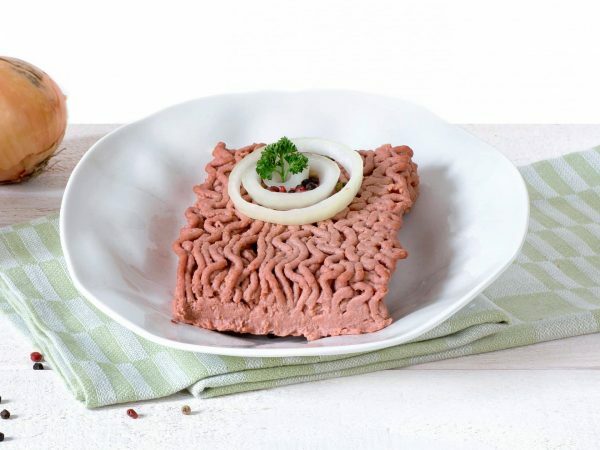 With this unique vegetarian Fresh Mince you can create and vary your own products. Make your own bites, hamburgers or sausages. This product is not yet cooked and one has to bring it to taste. A block of Fresh Mince weighs 250 grams. This product can also be delivered as a base dough for the production of plant-based protein foods. Water, 21% vegetable proteins (soy, wheat gluten), sunflower oil, starch (potato, corn, wheat), egg white*, flavourings, modified starch, beet root powder, hydrolyzed vegetable protein (soy), salt, spices, mineral (ferrous fumarate), vitamin B12 *Free-range eggs. Produced in a facility that processes peanuts and nuts. Meatballs: Season the mince and/or combine with egg and breadcrumbs. Mold into ball shapes and fry 3 min. on a low fire. Add water and cook through for 15-20 min. Remove the meatballs from the pan. Season with stock cube/powder and thicken with cornstarch. Place the meatballs in the creamy sauce. Forcemeat balls: Season the mince to taste. Roll into forcemeat balls and fry these on all sides in a frying pan with a dash of oil. Add the balls when the soup is almost boiling (10-12 minutes).